November 2, 2016 October 4, 2016 / J.K.
Bill Bryson decides he wants to hike the whole of the Appalachian Trail. He realizes that it will be long and he will be on his own, so he puts it out there that he’d like to have someone come with him. An old friend calls up and agrees to go. The first part of the book deals with their antics as they start off on their hike. Then the book somewhat drifts in the middle as he returns home (the plan is not to do the tail all at once, but instead break it up into different parts). He gives a bit of the history of the National Park service in general and the AT in particular. All the while doing minor hikes in the area of the trail that runs near his house, as well as taking trip down in Virginia and Pennsylvania to do other parts for a few days at a time. 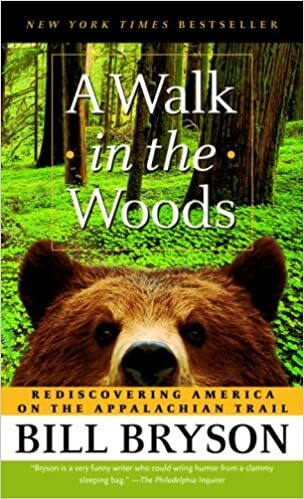 The final part of the book, he meets back up with his buddy Katz, to hike thru Main’s 100 Mile Wilderness. He wraps up the book with some final thoughts and reflections on his experience. By far the best part of the book is his early exploits with Katz. Anyone with jackass friends or people who have gone on long multi-day hikes with, let’s say, less equipped people, will appreciate the humor of the situation. The middle part really seems a bit listless and even like a later edition. Maybe it was just less interesting to me as I am pretty familiar with the AT and hike the Smokies at least once a year. This is also a movie now. I have no idea if it is any good, but if it’s on Amazon Prime or something, it’s probably worth watching.